It’s no secret that one of everyone’s favorite Disney cruise activities is enjoying the wonderful food onboard. 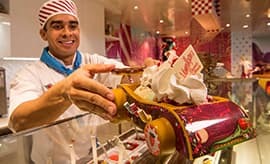 We’ve created an entirely new culinary experience with the all-new Vanellope’s Sweets and Treats aboard the Disney Dream. It’s your one-stop for delicious ice cream, gelato and candy shop. As you walk through the door of this enchanting shop themed to “Wreck-it Ralph,” you’re immediately immersed in the sweet aroma of waffle cones being prepared. 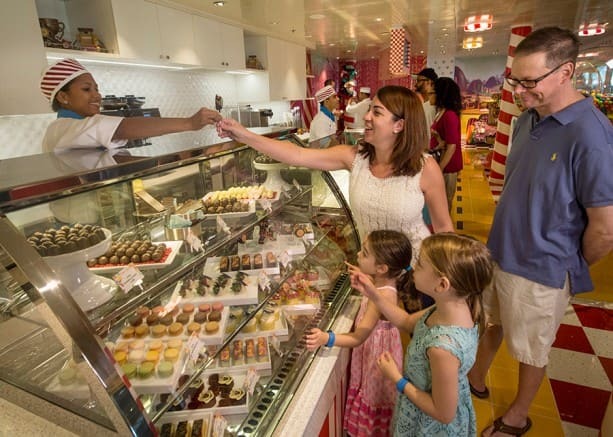 The festive shop offers 20 flavors of gelato and 16 flavors of ice cream, all handcrafted. The six artisan sundaes on the menu include two signature sundaes served in souvenir cups. 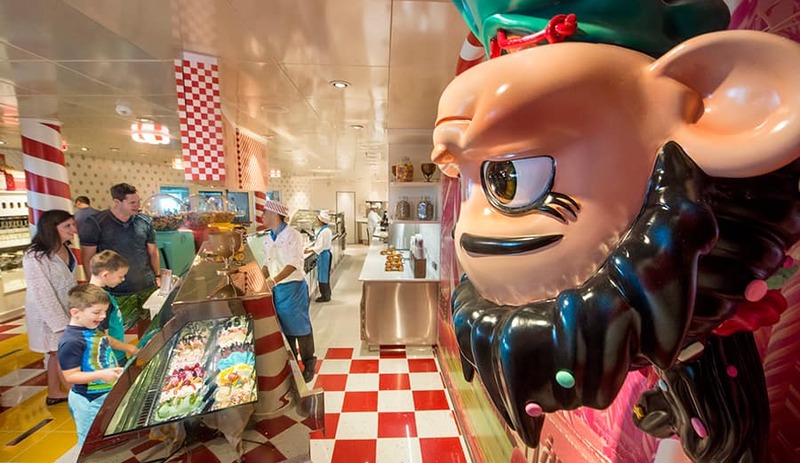 Vanellope Von Schweetz’s Race Kart Sundae features three scoops of ice cream and five toppings, while Ralph’s Family Challenge is meant for sharing, and includes eight scoops of ice cream and eight toppings. 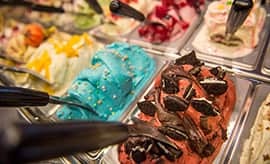 If you prefer to put your creativity to work, you’re sure to enjoy the selection of 28 toppings, a multitude of sauces and fresh fruit compotes, and the whipped cream made in the shop daily. What’s more, delectable desserts are sure to speak to anyone’s sweet tooth. Eclairs, designer cookies, cupcakes, candy apples, tarts and specialty brownies on a stick are just some of the delicious treats offered. A colorful candy assortment is available, along with signature lollipops atop King Candy’s lollipop tree. Here’s a fun fact: The shop’s animated leaderboard showcases the day’s trending sundaes. All six start the day on the board, and as they’re purchased, the leading sundaes move up the board to highlight the guest favorites that day. 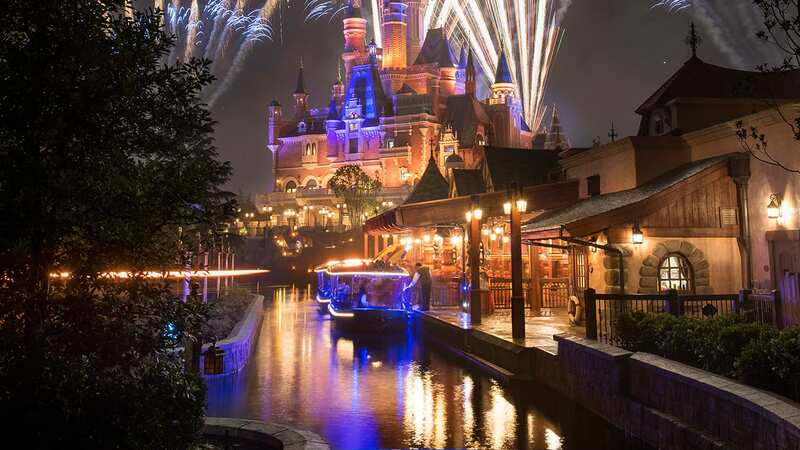 Thanks for reading my first post on the Disney Parks Blog. 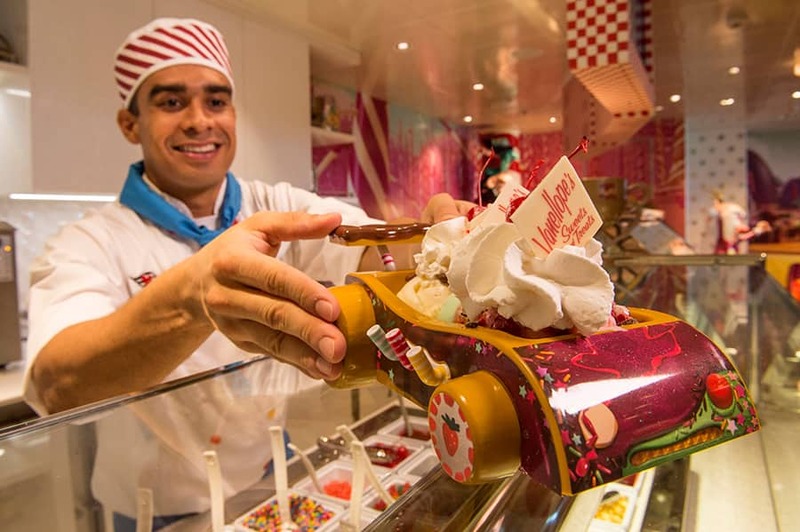 Check back next week for more fun facts about the sweetest addition to the Disney Dream. I’ll also share recipes for the delicious treats we serve there. Is there a different ice cream place on board of is this the only one? 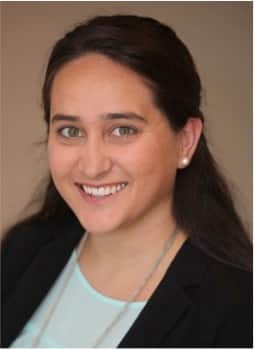 Welcome to the blog Ms. Kelly! This was on of the highlights of my recent honeymoon cruise! A MUST DO! Are these included in your cruise fare or are they an extra cost?